This page has been archived here from official Square Enix sources. It was originally posted on 30/11/04. I was recently faced with an errand that required me to travel from Bastok to Windurst, whereupon I had to choose between two methods of transportation. 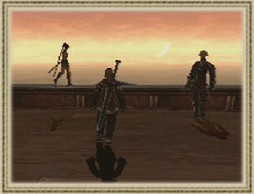 The first was to take the airship from Port Bastok, make a stop at Jeuno, and then proceed to Windurst. The second was to rent a chocobo at Bastok Mines and proceed directly to my destination. As a strong possessor of wanderlust, the latter scenic journey was quite appealing to me, but most would say that the first choice is far more practical. However, most would also agree that airship travel is quite dull. When traveling between Selbina and Maura or down the Phanauet Channel by ship, passengers have ample time to enjoy fishing or organize their belongings. Airship travel, on the other hand, is expedient but leaves passengers with little time to do anything. Most adventurers traveling by airship are fully aware of this fact, which is why one can often see them standing perfectly still for the entire journey. Perhaps said expedience can be a negative factor when traveling. Traveling by chocobo takes much more time than an airship, but you do not have to schedule your journey around departure times; you can head to your destination at your own pace. Riding a chocobo can be most enjoyable—not to mention challenging. Every time you take the reins, you can feel your riding ability improving. The exhilaration of gracefully gliding a mere ilms away from a deep chasm is indescribable. But in the end, nothing is more satisfying than a journey on foot, taking in the beautiful scenery and exchanging glances with fellow travelers. Though no words are exchanged, there is a mutual understanding that we all walk the earth with a sense of purpose. The journey, of course, consumes quite a bit of time, a seemingly endless trek through trees, bushes, and rocks. I for one often collide with such obstacles, but that in itself is an experience. "Could you please come as quickly as possible?" Sometimes, I was reminded, our choices are made for us.